This image is located in the northwestern portion of the Tharsis Rise at about 12 N and 125 W (235 E). 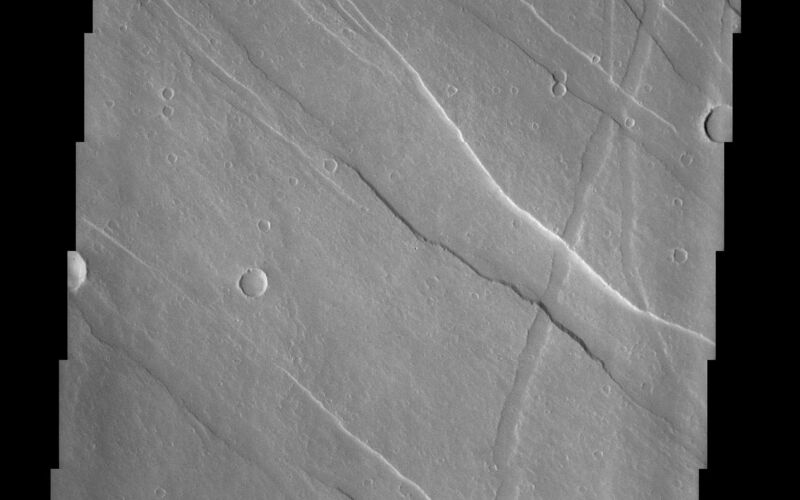 What is immediately noticeable in this image is the series of linear features that are called graben. These features are associated with crustal extension which results in a series of up and down blocks of crust that run perpendicular to the direction of the extension. Images of Mars have shown a large number of these tectonic features concentrated on or near the Tharsis region. The Tharsis region is an enormous bulge that causes major tectonic disruptions across the planet when it tries to settle down from its height and reach equilibrium with the rest of the planet. The graben in this image display a number of preferential directions indicating that the crustal stresses that caused the graben have changed over time. By examining the cross-cutting relationships between the features, it is possible to reassemble the history of the area. Now, if you thought that Mars was almost perfectly round, think again! The red planet has a large bulge sticking out from it called Tharsis. Almost 3,000 miles across, this enormous region rises almost four miles above the average radius of the planet. That's quite a bulge! Since Tharsis the land of the largest volcanoes in the solar system, it may have been formed by both the uplift of land from tectonic action and the build-up of lava flows. Tharsis can cause some pretty major tectonic disruptions across the planet when it tries to settle down from its height and reach a better equilibrium with the rest of the planet. In this image, located in the northwestern portion of the Tharsis Rise, a whole lot of lowered features stripe the landscape. They are called grabens, and formed when the crust of the planet was stretched tectonically. This kind of crustal extension (or stretching) tends to form a series of up-and-down blocks of crust that run perpendicular to the direction of the crustal extension. And that's what we see here. 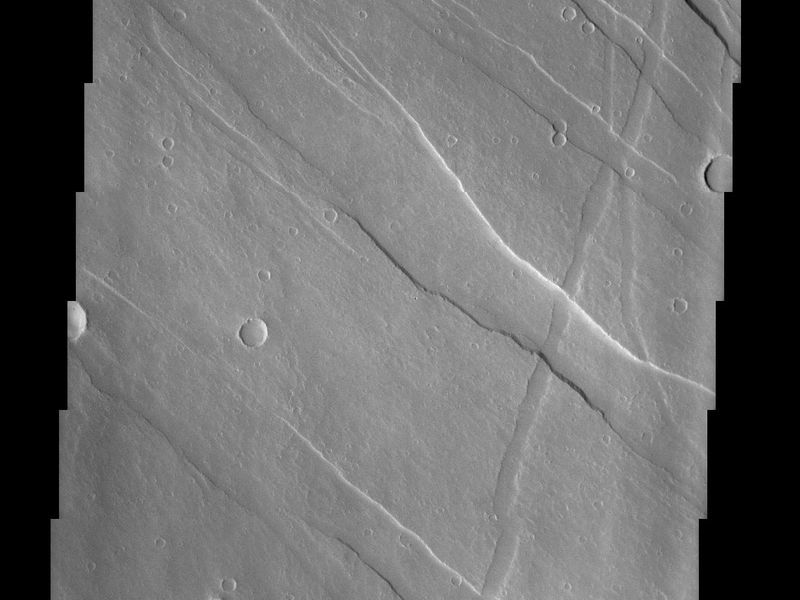 Since the streaks (or grabens) in this image aren't all perfectly aligned, that means that the crustal stresses and their directions have changed over time. And there's another history to be followed here too. Take a look at how some of the grabens cut across others. Those that cross on top of others had to have formed after the ones underneath. By looking at all of the crosscutting relationships, geologists can build up a pretty accurate record of which stresses happened first, next, and last. On Earth, a similar series of rift valleys (grabens) formed by crustal extension too. The East African Rift System began forming almost 30 million years ago due to volcanic activity that also created most of the high peaks in East Africa, including the famous Kilimanjaro. This African peak is so high it always has snow on top of it, even though it's located right near the equator. That height might remind you of the towering Martian volcanoes in Tharsis. The East African Rift Valley System also formed over large domes that were created as hot molten material beneath the Earth's surface welled up, pushing up the crust and causing it to expand and stretch. This stretching caused the rift valleys (grabens) to appear here on our own planet.